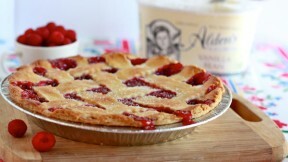 Discover the surprising ingredient for the best flaky pie crust in this raspberry pie recipe from blogger Jenna Weber of Eat, Live, Run. See the full post at the Fresh Tastes blog. Make the pie dough first. The dough can also be made days ahead of time and kept in the freezer. To make the dough, mix together the flour, salt and sugar in a large bowl. Add the cold shortening (I keep my shortening in the freezer for this purpose) and work mixture together with your fingertips until all the shortening has been worked into the dry ingredients. The mixture will feel like coarse sand. Add the water and mix until a dough forms then wrap up and keep in freezer until ready to use. For the filling, mix together raspberries, lemon juice, cornstarch, sugar and vanilla in bowl. Let sit while you roll out the pie dough. To assemble the pie, preheat the oven to 400 degrees. Take dough out of freezer and slice in half. Place other half back in the freezer. Divide that half into half again and roll out half on a lightly floured surface. Place pie dish on top and cut around dish (leaving an inch extra). Place dough gently in pie dish and prick all over with a fork. Place raspberry filling inside but be sure not to overfill. You may not use all of the filling! Now, take the rest of the dough and roll out thin again. Cut long one-inch wide strips of dough and weave onto the pie. Bake for 40 minutes or until golden brown. Let cool for 30 minutes before slicing.